HealthCore Services partners with independent healthcare providers to help self-insured or fully insured companies create an outcomes-based workplace wellness program. Our programs are designed to reduce your healthcare costs as an employer while saving time and money for your employees. Improving the overall health and well-being of your employees benefits your bottom line through decreased sick time, increased production, and employee retention. Comprehensive health assessments, patient education, mental wellness counseling and many other in-demand services are available either at your worksite location or nearby. We partner with area physicians, counselors, and health coaches offering the highest quality primary care and wellness services to provide long-term, convenient, ongoing care and improve employee health. No need for your employees to miss work time due to doctor visits when we can bring healthcare right to your company’s doorstep with mobile clinics and screenings. The providers who travel with the mobile clinics can screen patients for common health issues such as high blood pressure, as well as treat illnesses such as the flu that may be passed around the office, preventing more employees from becoming ill. Whether you already have an on-site clinic or are looking to establish one, HealthCore can help. Our physician liaison can connect you with a local primary care provider who is interested in staffing and running your clinic. A near-site clinic is an excellent option for employers who want to offer convenient, affordable primary care for their employers without the burden of operating an on-site clinic. HealthCore’s physician liaison will identify doctors who are interested in treating your employees and negotiate an agreement that is favorable for both parties. Weight loss, nutrition, and smoking cessation programs in are high demand. HealthCore will direct your employees to smoking cessation and nutrition experts who are dedicated to helping them change lifestyle habits. Having programs in place to encourage healthy living isn’t enough. Employee engagement is the key to long-term program success. Our dedicated representative will ensure that your workers are engaging in the programs you’ve put into place to meet your company’s goals. Nothing is more important than keeping your employees safe while they are on the job. Our on-site occupational health and safety services allow you to meet your OSHA requirements and compliance through employee education, hearing and sight screenings, drug testing, and driver testing. Innovative telehealth programs allow you to connect your employees conveniently and effectively with a doctor or mental health counselor securely through videoconferencing. 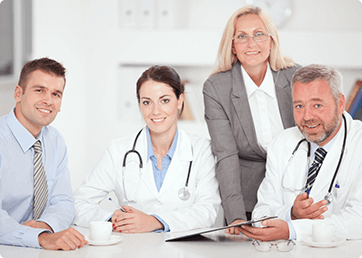 These practitioners can also be seen in person at their local office in order for your workers to develop lasting doctor-patient or counselor-patient relationships for ongoing healthcare.